DW 0CA0H ; 75 ..
DW 08C8H ; 110 ..
DW 0760H ; 134.5 ..
DW 06C0H ; 150 ..
DW 0548H ; 200 ..
DW 03D0H ; 300 ..
DW 0265H ; 600 ..
BAUD_DEFAULT: DW 01AAH ; 1200 ..
DW 0169H ; 1800 ..
DW 014CH ; 2400 ..
DW 012CH ; 3600 ..
DW 011DH ; 4800 ..
DW 010EH ; 7200 ..
DW 0106H ; 9600 .. The problem is: Enterprise serial port are fully software driven. And the 4MHz Z80 are too slow for higher rates. At the "middle-of-bit sync counter" need 0.5 value for 19200 baud... probably this is the reason why got the Modell 911 a hw serial port with SIO chip (it is expensive, when all other parts of the machine are cost reduced). Ah, ok, now I understand you. I though that the third bit was only a pause. The routine is not very efficient. On the other side, 9600 bauds can still serve me to connect the ESP8266 module. Maybe a new Serial/Net device must be created(but I have not the skills). On the BBC scene, they have UPURShttp://www.retro-kit.co.uk/UPURS/, a software driven serial port software that converts the User Port on to a complete RS-232 at 115K baud, all achieved with only a 2Mhz 6502 processor and few modifications on the cable. The BBC also has a RS-423 serial port, but I don't know if it is software driven like the Enterprise one. With it they can load disk images or any type of file. The driver can be loaded like an application or like a Rom. As you know I own two Enterprises with exactly the same add-ons, Saint 1MB internal Ram cards and 20Mhz CMos Z80 processors with selectable speeds 4Mhz and 10Mhz. If I connect them with the NET cable, they work as expected, but if I connect a stock EP128K to one of my modified computers at 4Mhz, the NET refuses to work at all. As the Serial/Net is software driven, can it be the memory different speeds the problem with the connection? Ok, thanks. I have read you about it before, but never though it would make a difference so big. A Spanish friend, Dandare, creator of the Dandanator for the Spectrum range, has aided me to interface the Enterprise serial port to serial ttl, for example to an USB to TTL adapter based on the CH340G chip, that allows handshakes. The main intention is to interface an ESP-8266 Wifi module. At last it worked without the two optocouplers at the right. Usually the Wifi modules work at 3,3v TTL, so the optional LM1117 will feed the pull-ups and the module. I have made a simple Basic program to talk with a PC, I can write forward, but I have problems receiving. The GET command gets stuck if there is no incoming character. 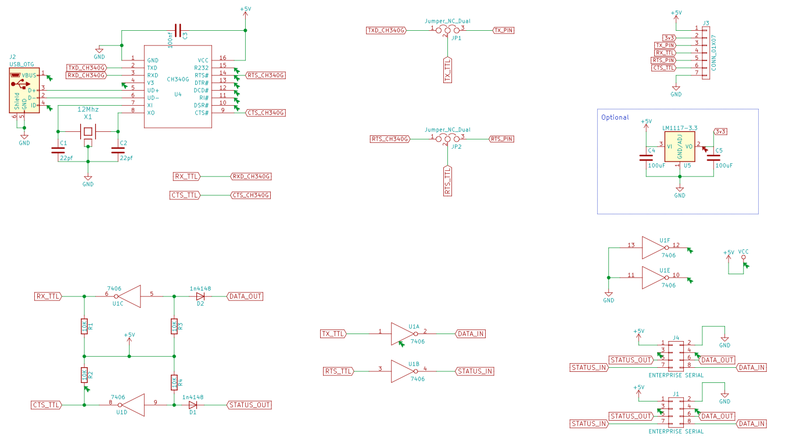 So, before reading the serial port I test bit 5 of Z80 port 0B6h(182) for incoming data. But this port is a "general purpose" one, and is corrupted by other drivers that write on it. Long time ago Zozo answered me a tip to overcome this situation, but I don't remember on what thread. Please, can you kindly repeat me the way to properly read the "Status in" bit?